This is for ALL bloggers, not just book bloggers! If you're seeking bread baking books or suggesting board books for babies or having a difficult time finding the name of the romance novel you read the blurb of while standing in line at the grocery store this meme is for you. 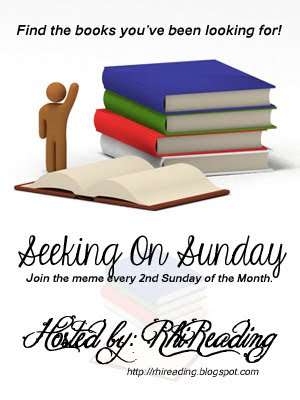 Seeking On Sunday is a meme hosted by RhiReading on the second Sunday of the month to bring together readers who are looking for book suggestions. feel free to share it in your sidebar too. Years ago I read Catching Midnight by Emma Holly which was okay but not one I would read again. What I did like about it and has stuck with me through the years is that the hero is a falconer and the heroine spends time as a peregrine falcon because she's a shapeshifter of sorts. It's just kind of an odd and unexpected thing to use as a plot point and now that my husband has finally got his falconry apprenticeship off the ground I was reminded of the book and thought I'd really like to finda few books featuring shapeshifter characters that are raptors (hawks, falcons, owls, etc.) either in romances or anything really. Does anyone have any they can think of? They can be secondary characters even! Now... to celebrate four years of blogging awesomeness and kinda the launch of the meme while I'm at it I'm doing what's—for me—a pretty darned big giveaway! In the meantime enter away! If you have any questions or problems just leave a comment! The only book that I can think of off the top of my head is Pamela Palmer's Feral Warrior series and the book, Ecstasy Untamed which features a hawk shifter. Thanks so much for the recommendations guys! I've been trying to find some for years so any suggestions are worth exploring. Be sure and drop in for the meme again this coming Sunday!